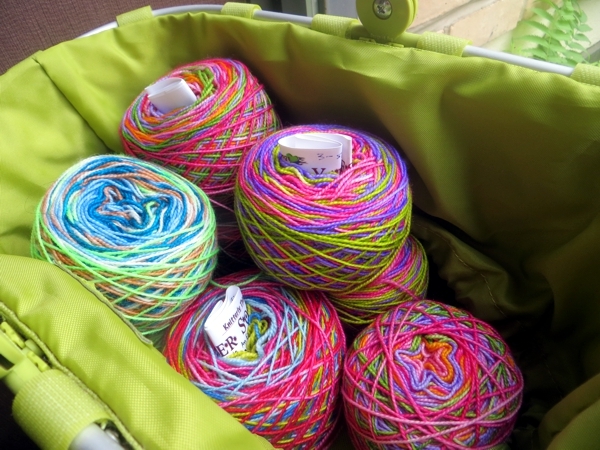 You know how a lot of we knitters refer to the yarn we own and haven't yet used as 'stash'? Well, I'm feeling like it's time for an image overhaul. Stash sounds so negative, like we're hiding it, or at least should be hiding it. What about 'stockpile', for those of us who need to know we'll never run out, or 'reserve' to honour the fact that it has a stabilizing value beyond its material designation? Or maybe 'horde', which sounds intimidating, as opposed to 'hoard', which just sounds like a burden. Yarn = not a burden. Well, whatever - my Vesper Sock supply is now much much more important to me than usual because Julia did in fact discontinue the original 100% merino sock this week. There is a new 100% merino now, but at a slightly different weight than before which is gaaaahhhh! because the previous version fits so nicely into all my shoes and is so perfect for my needles and preferred stitch count. I'm trying not to be disturbed by this, beyond having bought up every last scrap of the original base - there wasn't much - when I read the announcement. I mean, it's yarn. Many people produce yarn. Change is not a terrible thing. Julia is gifted and will have chosen a very attractive new merino base. All shall be well. ANYway, let's continue this post as though the news is the worst thing that ever happened to me. The prospect of the discontinuation of beloved yarn is a very good reason to buy too much and I appear to have done that very effectively. which is lucky because I still haven't figured out quite how to set up my caking station at the condo. Overall I figure I have enough here for 18 months of sock knitting, even if I don't fall deeply in love with Julia's replacement - and that's before I knit some scrappy socks with the tail ends of random colourways. If only I hadn't just realized last fall that an awful lot of the Vespers I knit to that point are just a little too short for me, but worn enough that I can't unpick and reknit them a little bit longer. I am going to need every pair of these socks to come, because I plan to gift the earlier shorter socks to a couple of friends with smaller feet and, perhaps oddly?, no problem whatsoever with used socks as long as they're handknit. Anyway: this is my weekend crisis. That and continued box packing and vacation planning - Pete wants to get away on a driving trip in July - and more exciting bill-paying because Renovation. YAY. Hope your weekend is great and I'll see you Monday! Excess sock yarn sounds like a contradiction of terms- it's sock yarn, how can there be too much? 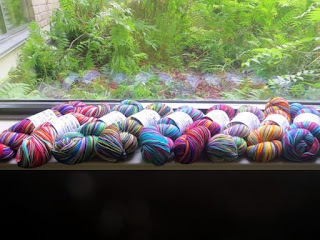 I have a sock yarn addiction, so an 'excess' of it sounds perfect to me! 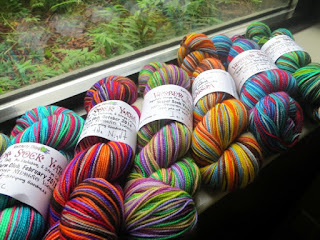 Ummm....I just ordered a ridiculous amount of lace weight yarn after I read that it had been discontinued. Understand that I have only ever knitted one project with lace weight. There is something frighteningly powerful about the words, "when this is gone, you can't get anymore." Mimi, I can't bear knitting with laceweight, and I would still have been tempted! Do you have a project idea or will you let it just be beautiful until the right one comes along?